These postage stamps are for real everyone. They are valid U.S. Postage produced by a technology called PC Postage. 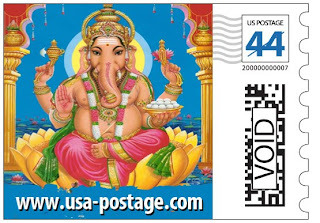 Usa-postage.com has created 7 spiritual designs targeted to the Indian community in the United States. 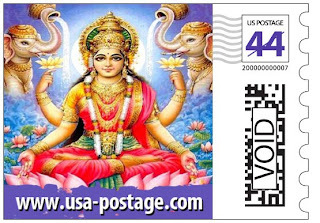 For the first time, real U.S. postage depicting Sai baba, Lord Venkateshwara, Lakshmi, Murugan, Vinayaka, Shiva – Parvathi and Sri krishna is available on beautiful 20-stamp commemorative sheets. These are exclusive designs not available anywhere else. We imagine that these are going to be really popular with wedding invitations and Diwali cards. Of course I can't wait to get a letter in the mail from a hipster friend that thinks the graphics are cool. Sort of like Gwen Stefani rocking a bindi...cool? Hey - can't find these anywhere on the usps site - do you know what's up? They are not on the USPS website. Goto the link that we posted. This is an independent company that works with the United States Postal Service. We at Chor Bazaar do not produce these stamps. We simply wrote about them. It looks like this stamp company went bust. Their site is no longer active.